Kurosawa is part of a contentious tradition now with Bergman and early Fellini in cinephilia for not making "open" movies. The main claim would be that their perfectly executed, pictorial frames do not allow for interpretation beyond what they present. These films do not require explanation in the way that their counterparts - Mizoguchi, Rosselini (only the latter works) and Antonioni respectively – make films that are only legible to those who have truly engaged with cinema. While I could point to Andrew Tracy’s piece in Cinema Scope at the time of the AK100 Criterion set (“prompts the question of why his presence among the most active and engaged sectors of present-day cinephilia feels so pallid,” a sentence that certainly doesn’t engage in any sort of exclusion process) or even David Bordwell’s defeatist attitude (“I still find most of his official classics overbearing, and the last films seem to me flabby exercises”), this would be falsely presumptuous to lay the blame on contemporary shoulders. Kurosawa's images tell you how to read them. He explains emotions, power relations, and other abstract elements made literal by the camera placement. The mistake, it seems, to describe "straight forwardness" as a lack of complexity in the filmmaking. What appears to be at work here is an element of snobbery - because Kurosawa makes images that even someone who has not watched the entirety of world cinema can understand, the lack of a need for criticism means they are necessarily bad. Add to this the comparisons many critics will make by contrasting Kurosawa with Ozu and Mizoguchi, when 1) Kuorsawa worked at Toho, a studio that had a radically different style and approach than Shochiku, 2) he began making films in the early 1940s, almost two decades after the latter two 3) the extreme differences in genre that are always ignored (This is why Ikiru is always the favorite a rallying cry of Kurosawa's skeptics because it's his "Ozu" movie, and thus when its approach is not Ozu enough, it’s clear that Kurosawa is a terrible filmmaker). One does not sit around comparing the styles of Lang and Fassbinder simply because they emerged from the same country, and yet with the Japanese cinema, such comparisons are made without rationality. Why must we have Kurosawa versus Mizoguchi or Ozu? It’s at this point I simply turn to Kent Jones: “The appeal of systematic rather than case-by-case exploration is obviously great, as great as the lure of enlightenment in the realm of art and outside of organised religion. However, I find it troubling to read rejections of religious and political dogma from critics who simultaneously espouse aesthetic dogma. 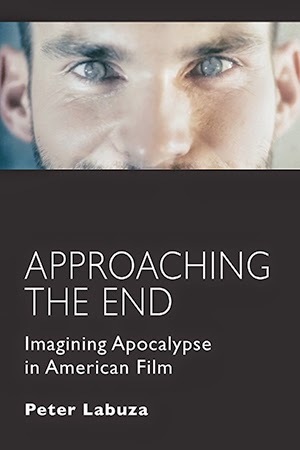 I have a feeling that serious film criticism is afraid to hoist up the anchor of moral essentialism for fear of drifting off into the shallow waters of connoisseurship. I suppose that moral essentialism offers a guarantee of seriousness.” (If you want some serious debate, may I suggest this Dave Kehr comments section?). Perhaps instead of reading Kurosawa against, we can read him alongside. Seven Samurai is the most protected film of the Kurosawa legacy, #17 on the Sight & Sound list for both critics and filmmakers. It’s also probably notable for me as one of the first films I convinced my dad to buy the Criterion DVD for me even though I had never seen it, or much less any foreign film (only two or three months later, I would get Netflix). 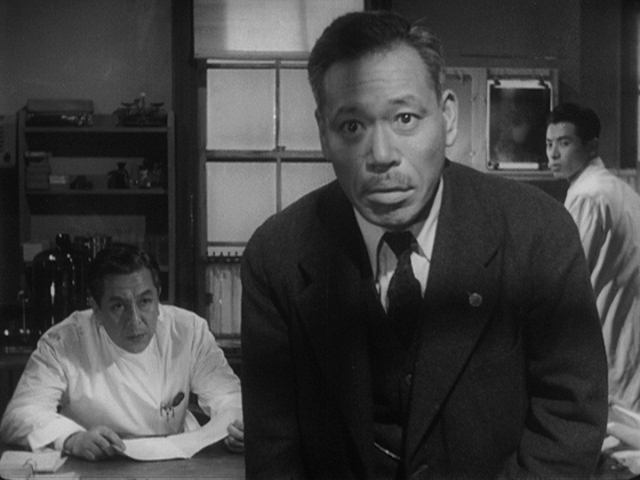 Seeing it in 35mm though makes the expressiveness of Kurosawa’s images more pronounced. His camera movements are exacting, and he prefers to work in what many have described as living paintings. Many shots show an extraordinary amount of depth—often four or five separate layers to each frame. That Kurosawa ignores his negative space is an issue for others to discuss, but he does create precise spatial relations and sometimes makes very bold jumps in editing (I recall one moment in Ikiru where the old man confronts his son; Kurosawa abrasively cuts to his wife in the foreground of the frame in the darkness, silently controlling her husband). 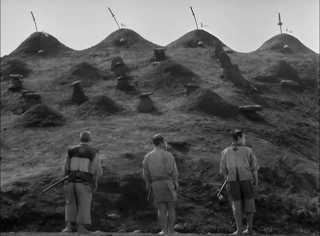 The early sequences in Seven Samurai are shockingly advanced in their storytelling, giving strength to those who might otherwise be seen as none (the village leader in extreme close-up) and finding apt metaphors (Mifune behind the gates, shaking them like prison walls). There’s a very tricky balance of cynicism and optimism Kurosawa plays with, the kind that I think wildly shifts from scene to scene, unlike the more reserved emotions seen in Ozu. I find this incredibly effective for Kurosawa’s films, a direct conflict in every moment that shifts and turns us violently as much as the very plains of the filmmaking space. Kurosawa might go bold, but he undercuts his moments; the broad humor of the discovery of the armor is played against the revelations that the peasants have been holding out on them. The romance of the budding spring is played against the tragedy of the stolen wife. If Kurosawa’s characters speak directly, they also speak in contradictions. 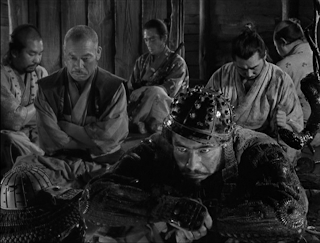 Rashomon is not the only film of Kurosawa’s to present different forms of truth; each film is about a series of truths and lies, of dialectics at work that will never be truly resolved, only accepted as an impossibility. Why then, “to live,” to put it in the form of a Kurosawa title? In his films, action is a form of humanity. If Ozu is defined by the final passage of Early Summer, passively accepting life like the flows of barely, and Mizoguchi is survivalist, nature runs its course without a care of humanity as in the final shots of the devastation in Sansho the Baliff, then Kurosawa is the active existentialist. Life has no meaning without being or creating, even if it is unrecognized by peasants who carry on their celebrations without honoring the dead, a small playground only beloved by a group of mothers, or embracing a forgotten child. 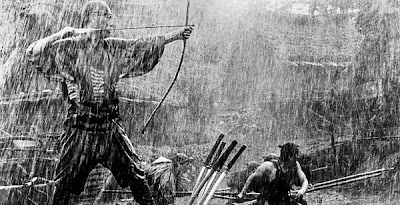 Death often feels pointless in Kurosawa; an unfortunate cause for the living, which always brought out the nihilist in him. There are fatalist attitudes in the filmmaking, and even Bordwell has eloquently pointed to how this is reflective of his shooting style. But it was contradicted by the hope; the humanism that defined (and perhaps takes too much emphasis now) in 1950s world cinema. For while the graves sit silently unadorned, a new field sprouts once again. Perhaps then, Kurosawa was a Westerner after all, not for his proximity to the American cinema, but toward European philosophy. 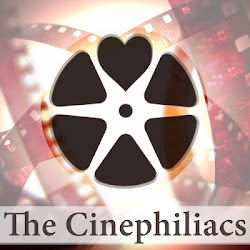 *The quotes from Cahiers Du Cinema can be found in Cahiers du Cinéma: The 1950s: Neo-Realism, Hollywood, New Wave, edited by Jim Heller.